It can be easy to become overwhelmed with the latest thinking about social media marketing and to feel too busy to refresh our practices in the midst of all the other activities involved in recruiting international students. But it is also all too easy to not achieve the results you’re looking for by not adapting your use of social media platforms to best effect. Today’s post is on Twitter: we’ll provide some of the most important new information that should guide you on how to use it in educational marketing, and we will include a focus on how to effectively use hashtags (the # device in tweets). The number of active Twitter users is continuing to grow, albeit at a slower pace in the last couple of years. There are now 271 million active Twitter users across the globe, up from 30 million in 2010. Importantly, 78% of these active Twitter users are on mobile, and 77% of accounts are outside the US. Almost half (45%) of Twitter users are aged 18-29 – the age of the majority of study abroad students. Still, there are other reports that suggest there are in fact a substantial number of Chinese on Twitter due to proxy services that allow users to connect to servers outside of China. In addition, Twitter is seeing significant growth in Indonesia, Saudi Arabia, and Singapore, and the service is very popular in Japan – bigger than Facebook and recently vying with Mixi, the country’s own popular social network, and newcomer Line. Moreover, audience engagement with tweets with image links are reportedly 2x higher than those without them. 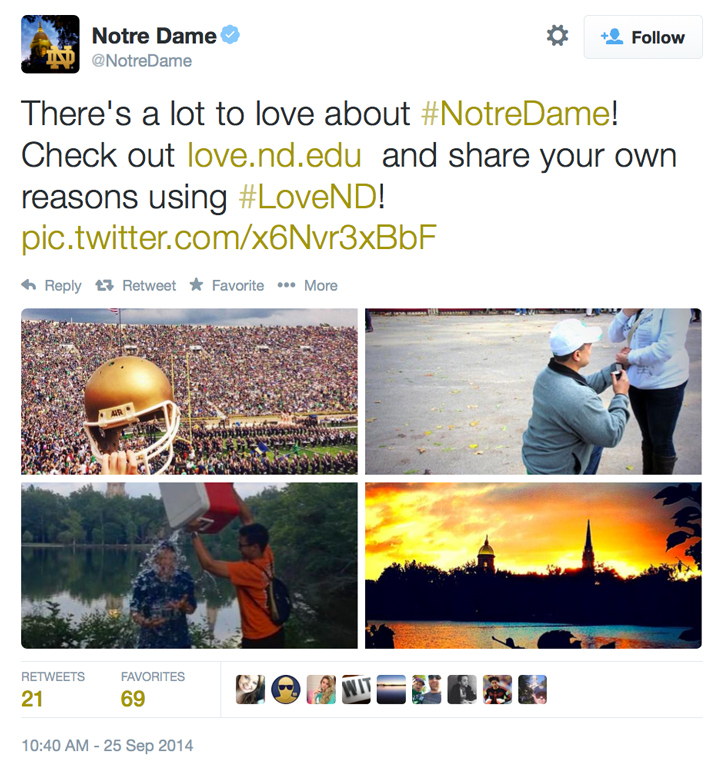 We know that images are a good idea in Twitterland, but what about hashtags? As a refresher, a hashtag is the pound sign (#) placed in front of a word or a few words mashed together to create a short, searchable link (e.g., #elearning). This allows people to search Twitter for topics they find interesting, and see what others are saying about it. A hashtag (with enough relevant users) becomes a micro-discussion forum and a way that users can differentiate information they are looking for from more general feeds or Twitter streams. Don’t include spaces. For hashtagged links with more than one word, you can add uppercase letters at the start of each word (e.g., #StudyAbroad) – this will not affect your search results. Do include numbers if you want (e.g., #Education101) because Twitter supports this – but it doesn’t support punctuation marks such as commas or apostrophes. Do create a hashtag if you want to have one specific to your brand campaign – in other words a brand new one not used by others – but only if you let your stakeholders and intended audience know about it. If you don’t support it with complementary marketing, it won’t get used or shared. Do conduct research on popular hashtags to see which ones will get you the best reach (at different times of day). For example, here’s one evaluation of the popularity of #studyabroad. Tweets with one or two hashtags have 21% higher engagement than those with three or more hashtags, and tweets with more than two hashtags prompt a 17% drop in engagement. So it’s best not to go overboard with them. In addition, consider whether your hashtag is used by prospective students in their searches – and that you’re not just using industry jargon. Which hashtags are Indian students using to find graduate programmes, for example? Ask your current Indian students – and ask the agents you’re working with whose local knowledge could be quite useful here, including how to translate/adapt hashtags into particular languages. Remember that Twitter is not “push” marketing – the reason it is so effective is because, at its best, it is a conversation – one in which followers feel their engagement is appreciated and that they are listened to. Brand marketers – including educational institutions – should not pursue “reach” via hashtags and other means at the expense of really engaging with followers. There are far better ways to tell prospective students about an exemplary reputation for safety than abusing the hashtag of a well-meaning public advocacy campaign. Such a gross example of newsjacking would likely cost UniversityX many followers. The university could instead include a link to the study naming it in the top 10 for safety, as well as a link to an image from the study. This would be far more likely to be retweeted and engaged with by the university’s Twitter followers. Even if newsjacking is relatively innocent, (e.g., using #fifaworldcup around the time your country’s team is competing), followers will quickly see through the tactic and be anything but impressed. Please see the following infographic for a quick summary of additional stats and tips. This entry was posted in Africa, Asia, Australia/Oceania, Europe, Marketing, Middle East, Most Popular, North America, Regions, South & Central America and tagged boarding schools, language schools, colleges with international students, youth trends, Indonesia.